When pure maple syrup is heated to a temperature of approximately 260 degrees, then removed from the heat and stirred until granulated... Voila! you have maple sugar. 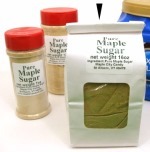 But, if you intend on making your own pure maple sugar, be careful! Boiling maple syrup can "boil over". Use a commercial food grade de-foamer, vegetable oil, cream or butter around the rim of the heating pan to contain the foam. But frankly, it's just a lot easier to purchase it. Let us do all the work.